Pucca’s Restaurant is one of those game that’s so hard to put down. Not only does it feature a familiar (and quite popular) character, it also incorporates great gameplay to the mix. The game puts you in the shoes of a cute little Korean girl who is aspiring to become one of the best chefs around. You start off as a mere underling and have to work your way up the ladder in a 5-star restaurant. You can slowly reach your goal by keeping customers happy and serving them great dishes. Like most sim games, this one provides tons of fun features. Worth checking out if you’d like something to get busy with during your spare time. If you’re wondering where you’ve seen Pucca before, she’s actually the face of Korean company Vooz. Co. Ltd, which is owned by The Walt Disney Company. Originally meant as an animated e-card only, her popularity soared and now she’s featured in animated cartoons, books, video games and so much more. 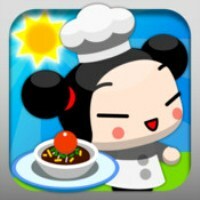 As for the game, Pucca’s Restaurant is a lot like Restaurant City. It starts off by showing you the basics: how to prepare the dishes, how to serve them to your customers etc. As you progress, things start becoming a little more complicated. Since you’re the chef, you need to create up to 50 different dishes to serve to your customers. At the same time, you need to make sure that your restaurant is as appealing as your cuisine. Things like decor, chairs, tables and more, would greatly matter in keeping your customers happy. There’s a very nice element of reality to the game. You can interact with fellow gamers online while managing your restaurant. The stoves in the kitchen cook in real time too. So you have to make sure dishes are served to customers right away otherwise they’ll spoil and gather flies. There’s a good list of meals to choose from. Mastering every single recipe is a part of your goal in order to become a master chef. Apart from all that, you also need to hire staff to keep your restaurant going. Whew, talk about a handful of things to do! However, that’s what’s fun about the game. If you love a good challenge; this is one game to consider. Overall, Pucca’s Restaurant is very entertaining. It has everything you would come to expect from a sim game and more. The best part is that you won’t have to shell out any cash for it.